Today TastedOnline.com is celebrating it’s fourth anniversary. It was an unusual year for us because we spent almost six months in California and with that geographic change our wine drinking became more West Coast oriented than it’s ever been in the past. And, that wasn’t all bad, we had some great finds with California Rhone blends and Zinfandels we never would have uncovered if we were not living there. It was a good wine drinking year and 2016 provided countless memorable times sharing wine and food with good friends. Again this year we are changing the presentation format for our year end review. In the list below you will find the best value wines we had in 2016. The list is alphabetical, and includes a wide range of wines from throughout the world and prices between $10 to several hundred dollars. So no matter what your taste or budget you will find some OUTSTANDING wines on our list. We have also identified what we thought were the Best-of-the-Best by setting them in Bold type1…these were the wines we thought stood out and should have special recognition. 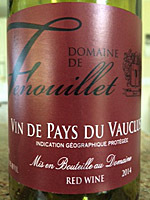 Our pick for the very best value wine of 2016 was Domaine de Fenouillet Vin de Pays Du Vaucluse 20142. And last but not least, our pick for the best value North Carolina wine was Junius Lindsay Vineyard Syrah Reserve 20103. We drink a LOT of very excellent wines over the course of a year, so this list is significant and really separates the men from the boys…read our review to see if their “your” kind of wine, than buy and drink any of them and you will not be disappointed…GUARANTIED!!! 1. Our pick for the Best-of-the-Best wines. There are always a few wines that are extra special and we think these should be recognized. The wines that make this list are the ones that are way under valued, they are simply a fantastic buy for outstanding wines. 2. Annually we identify one wine as the Best Value wine we have reviewed over the past year. It’s usually a very inexpensive wine (around $10) that drinks like a wine that costs many times that price. These are wines every wine drinker, regardless of the price point you spend per bottle, can make a purchase and be assured it will be an outstanding bottle of wine. 3. The Best Value North Carolina wine. We have tasted a lot of North Carolina wines over the years and quite frankly we haven’t found many that were very drinkable, let along good. So this listing in the TastedOnline.com year end review is VERY significant. And, possibly even more noteworthy is that we identified Junius Lindsay Vineyard Cellar Select Roussanne 2011 as last years best North Carolina wine. Try either of them and you will have a whole new appreciation for Yadkin Valley, North Carolina wines!! !